Do you disapprove of people who fold down the corners of the pages in books? Well so do I, usually, though I’m making an exception for The Folded Book Company. I love their intricate creations. Book folders use patterns, which are adapted to the number of pages in each book, with a specially created ruler to fold down pages to create a 3D design. Unlike papercutting, the pages are only folded so the book remains an intact object; you could still read it if you wanted to. This is my slightly wonky attempt. There’s a full range of patterns to buy on Etsy. I’m working up to the anatomically correct version of the above. 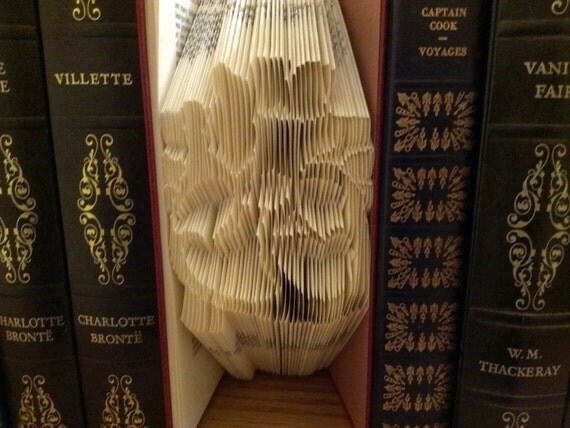 What do you think of folded books? What design would you make? Everyday Sexism is the most important book of the year. I’m not the only person that who thinks so. It’s on the Waterstones Book of the Year shortlist and has received a wealth of critical praise. More importantly, it has inspired conversations about present day sexism and is part of a positive movement for change. The Everyday Sexism Project started as a way for women to share their experiences: The Everyday Sexism Project exists to catalogue instances of sexism experienced by women on a day to day basis. They might be serious or minor, outrageously offensive or so niggling and normalised that you don’t even feel able to protest. Say as much or as little as you like, use your real name or a pseudonym – it’s up to you. By sharing your story you’re showing the world that sexism does exist, it is faced by women everyday and it is a valid problem to discuss. The book is arranged thematically, with an informative introduction to each section establishing how things are for women at this moment. Anecdotes are closely linked to the topic and intelligently illustrative. Overall the book is brilliantly written: clear, accessible and honest. This book should be required reading for all. I see these used wrongly quite often. Avoid errors with this simple rule: bare means not clothed (people) or covered (objects). For everything else, use bear. Hence the joke: I walked into a bar, bear with me. No really, there was a bear with me. So, unless naked, think grizzly. Before I even mention the content, let it be noted that The Arrival is a beautiful object. It is a tall book with an indented cover and a golden ribbon. It feels like an important book, and it is. This wordless graphic novel depicts a migrant’s journey from home and family to an unfamiliar land. It is a universal story, made new by sepia pencil and Tan’s extraordinary imagination. Unique architecture, language, creatures and modes of transport challenge the arrival as he seeks a place to stay and employment. I found the panels that ‘zoomed out’ gradually from close detail to a vast landscape particularly effective. The ‘silence’ of wordlessness gives extensive potential for personal interpretations. My partner, a former student of international politics, found in it metaphors for global dominance and subordinated nations. It is also the story of a person trying to belong and make a home. It has the depth of a novel. It is timeless. Visit Shaun Tan’s website to see more stunning images, or get your hands on a copy to see them in their full glory. Have you read it? What did you think? I’ve only read a few graphic novels, are there any others that you would recommend? Comments please! This much bigger than War and Peace! I’ve loved the show since I learnt ‘Castle on a Cloud’ as a tiny child, and the film was magnificent, so my sister suggested that I should read Les Mis. I thought that sounded like a good idea, until I saw it, all 1,194 pages of it. It was brought home from the library so we could all have a jolly good laugh about it, (holding it next to War and Peace, discussing how few copies it would take to build a house etc.) but then there was a power cut: hours with nothing to do but read by the glow of the fire. So the opening isn’t exactly gripping: Hugo admits, ‘There is something we might mention that has no bearing whatsoever on the late we have to tell – not even the background.’ The whole of book one is a long origin story for the bishop that gives Jean Valjean the candlesticks. It spends rather too long listing his household expenses and describing his taste in interior design, which is all white walls and sacking. This whole section is basically seventeenth century Cribs, but with more philosophical deism. It gets interesting when we meet Jean Valjean, particularly as he does keep declaring ‘my name is Jean Valjean!’ like in all the songs. The cleverest technique used in the book that simply wouldn’t translate to the stage is the element of surprise. For example, we learn that years after the bishop has given Valjean the silver, in a completely different town there is a business that has revolutionised jewellery making. We are then introduced to Monsieur le Maire who runs the factory. It is only when Javert turns up to hand in his notice after ‘falsely accusing’ the mayor of being the fugitive, Jean Valjean that we find out that they are in fact one and the same. It is used again to express the fall of Fantine; we see her luck change as she has to leave the factory and give her child to the innkeepers to look after. Later, we meet a woman who has sold her hair and front teeth and become a prostitute. We later find out that this is Fantine. Fantine has had a properly horrid time of it in the book. Cosette’s father is particularly awful and breaks up with her by sarcastic, flippant note, which is like the old school equivalent of dumping someone by text. When it comes to Fantine’s demise, she is very weak, but pushed over the edge by being scared to death by Javert. In the book, Valjean does not manage to escape from Javert here to get Cosette; he is imprisoned, breaks out (by pulling apart the bars like a superhero), and is then imprisoned again (and given a new prison number- he is no longer 24601, but the less rhyme-able 9430). Sentenced to life, he is next seen doing hard labour on a ship where he breaks his chains and risks his life to save someone dangling by their ankles from the rigging. He then dives over the side, into the path of another ship, and is presumed drowned, but he’s basically super-human and lives to find Cosette. Javert finds out that someone turned up to claim the child (or ‘kidnap their daughter’ as the immoral innkeepers are putting it) and goes in search of Valjean. They barely escape this time as Valjean hides in a coffin, but is inadvertently buried alive. It’s dramatic in parts, but there are also long swathes of battle descriptions and long back stories for every minor character. However, it is very pleasing when a line from the text has been directly used in the songs: so far, someone has ‘dreamed a dream’ and the innkeepers really do charge more for sleeping with the window shut! Many years later, Marius has just been introduced and there’s rather a lot about how he became such a radical. So I’m half way through- that means I’ve already read the equivalent of several normal length books! I think I may well persist, if only for Jean Valjean’s Houdini escapes and feats of strength, and to continue to play ‘spot the lyric’!